* Club insurance and By-Laws finalized and to be put in place by Memorial Day. * Letter sent out to members who are overdue on their dues payment – approximately 220 letters sent out during 1st week of May, 2011. * Bill Masterson mentioned about 4 teams from Club who participated in the Boston Marathon….1st was the Men’s Masters team…..2nd fastest was the Men’s Open team……the Women’s Masters came closest to the Top 10……and the 4th team was the Women’s Open team. * Discussion about the possibility of having Honorary Members category with regard to Club Membership and how to address. To be discussed by Club Board of Directors. Motion to leave freezing Honorary Membership until September 2011 – motion accepted. * Discussed the prospect of a new Club newsletter – 2-page format to include the Presidents letter, Club contributions to other charities, Club banquet pictures, etc. * Tri-Team – new Director to be Andy Scherding. 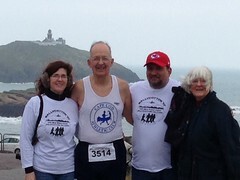 New Tri-Team clothing distributed. * May 21st – 5k run @ Nauset High School – CCAC to assist – Volunteers needed! 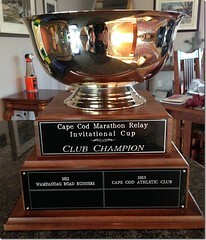 * Discussed the idea of a Cape Cod 10-mile race and also the possibility of having a Club summer cookout. No conclusions reached. What could be better than spending the long Memorial Day weekend cooking out and camping? How about spending it running, biking, swimming and more with your fellow athletes? All weekend long we’ll be running the trails of Nickerson State Park, going on group rides, and having a couple of swim clinics … while staying in the luxurious cabins of camp Nan-Ke-Rafe nestled at the back of Nickerson State Park. Here are all the details and if you’re planning on coming, notify Andy Scherding as soon as possible. It doesn’t matter if you’re not a multisport athlete – come run, hike and camp – cookout, toast marshmallows, run some more, work with run and swim coaches, get to know your fellow athletes – come for a day, a clinic, or the whole weekend. It’s guaranteed to put an extra boost into your spring training! This morning I am thinking I had better get a few thoughts down on weekend past before they slip into the fog. I had opted for this race a while back when I had discovered that once again the Self Transcendence 6-day in NY was piggy-backed onto a start date the same week of Boston.Three days recovery not enough, ‘less you are a Spartan or John Price. My now-laughable goal was 201 miles, which I had ambitiously stated to secret believers, but in fact had done before in 2007 in the first three days of that 6-day in Flushing Meadows - 88,55,&58, - and also after another hard Boston. Could I really have aged all that much in four years? (Why, YES ! !, you old fool) the running gods shouted gleefully. 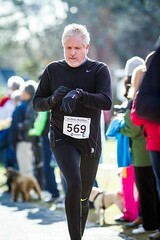 I ended up with 160 miles, good for seventh place, with 62, 63, and a wimped-out & slacker 35. No real excuse, either. Fit me for a dress, as Bill Parcells would say, but oops! – the overall champ Charlotte was WEARING a dress! I just sat or lay in my tent the last 11 hours of the event listening to the rain drops or chatting it up with folks while watching the valiant efforts of the more stout hearted competitors. I am still competition-minded, too, but somewhere amongst the drizzlies long about day three, just lost the drive. Canadian Don Landry kept churning away and really deserved to catch me, but missed by a scant two miles, and I reaped little satisfaction out-totaling him whilst curled up with my wussy Cowardly Lion feelings. The course is good, the administration excellent. 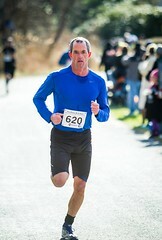 Rick McNulty actually organized a race that went an extra day after my suggestion a few months ago. I cannot think of a single negative. Many, many positives, as mentioned in the Joe Judd and Kevin Flood reports. There was a delay in getting the results, but that was due to my poor computer skills. If I am in any way unique, it is because I am as interested in your races and totals as I am in mine, a lifelong intense passion that always seems to surprise folks who don’t imagine how much I am aware of their efforts long before I even meet them. I gain much inspiration and knowledge from this observation, and such runners as Steve Tursi (combo NBA & NFL look-a-like lost in ultraland), Hung-Kwong Ng, Kevin Flood (Mr. Generosity), Joe Judd (best ultra physique, with legs starting somewhere around the arm pits), Bill Gentry (he would be within his rights to charge an entertainment tax), beauteous Shannon McGinn, and Sir Mike Potter just motivated the heck out of me by their very diverse but always earnest approaches to their racing. 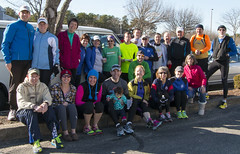 And all of these runners I was meeting in person for the first time. The commonality of ultrapeople are that they seem to comprise just the substance you are looking for at the moment. Need a little chuckle? Perhaps a thoughtful opinion? A little advice? A soul talk in the wee hours of the night? And always, always, there is the compassion. "How you? Man, I am hurting.. this is a stupid sport anyways. What in the world made me ask for a third day? But you want to go around again? Okay, i will try one more, just to stay on yer good side…"
And so it goes. You end up with folks you just like to be with. Cheer their efforts, learn about their lives. Nothing, it seems, is deemed too personal. They’re interested in the real stuff. I love ultrarunning. I love the embodiment of its fit with the Teddy Roosevelt quote about the brave gladiators down in the blooded sands of the arena. I love the short essay of Mr. David Blaikie, who said: "Perhaps the genius of ultrarunning is its supreme lack of utility. It makes no sense in a world of space ships and supercomputers to run vast distances on foot. There is no money in it and no fame, frequently not even the approval of peers. But as poets apostles and philosophers have insisted from the dawn of time there is more to life than logic and common sense. The ultrarunners know this instinctively. And they know something else that is lost on the sedentary. They understand perhaps better than anyone that the doors to the spirit will swing open with physical effort. In running such long and taxing distances they answer a call from the deepest realms of their being — a call that asks who they are…"
Unfortunately, "who I was" in this one was surely lower than the where I had placed the bar. Not what I had intended. But luckily, hope springs eternal. To copy from the man from Tennessee: Training starts tomorrow. Chatham Harbor Run–26 June: Register Now! * Motion for Club to accept board recommendation regarding insurance – motion accepted. * CCAC By-Laws – rewritten by Cathy Whitelaw as updated by Board of Directors. Posted on CCAC website. Per Bob Edwards, only change under consideration is that the total number of members constituting a quorum at meetings where CCAC business is voted upon is to be changed from 20 to 15. * Larry Cole presents motion to change the quorum from 20 to 12 members present at meetings regarding CCAC business. Motion accepted. * By-Laws as proposed – accepted by all members present at meeting. * Elections for 2011-2012 term: Bob Eckerson – President, Joe Weinberger – Vice President, Adam Ross – Treasurer, Mary Ellen Ross – Secretary/Clerk. All four individuals have accepted their positions for another year. All officers accepted by all members present. * New Business – Andy Scherding mentioned that he is trying to get CCTT people to attend CCAC monthly meetings and mentioned possibility of having a speaker/coach/nutritionist there at meetings to speak to members and anyone else present in order to generate interest. *Cape Cod Child Development – talk given by Pat Nally. Non-Profit program – CCAC to donate $100 for program – Motion voted and accepted at meeting. How can you repeat doing anything 29 times and still find it interesting? Something to value? You might even describe — my goodness — , precious? Make it the Boston Marathon, and find out how. Or better yet, why.